By the late seventies, computers were increasing their role in all aspects of the economy. Companies in and serving the tech industry were growing. Consistent with its varied portfolio, the firm continued to seek new design opportunities. A small start-up delivering component technology, Teradyne Connection Systems, was experiencing explosive growth and in need of a new facility. Two entrepreneurial Teradyne engineers, Windsor (Windy) Hunter and Len Johnson, along with a few of their colleagues, had convinced company leaders to fund their idea to design, manufacture and market “component product technology” for computers. Convinced this was the future of the industry, they demonstrated initial success with military contractors where the components were used in weapons systems. They saw an opportunity to transition the technology to serve the expanding consumer computer market. The anticipated volume increase would require setting up a new headquarters and manufacturing facility. This was an exciting and broad directive. Having a seat at the table during the organizational discussions allowed the firm to quickly suggest architectural planning approaches that closely mirrored their idealized organizational thoughts. Teradyne chose a 19 acre wooded site in Nashua, New Hampshire, pushed over the border by the high tax burden Massachusetts placed upon high tech companies in the mid 1970’s. 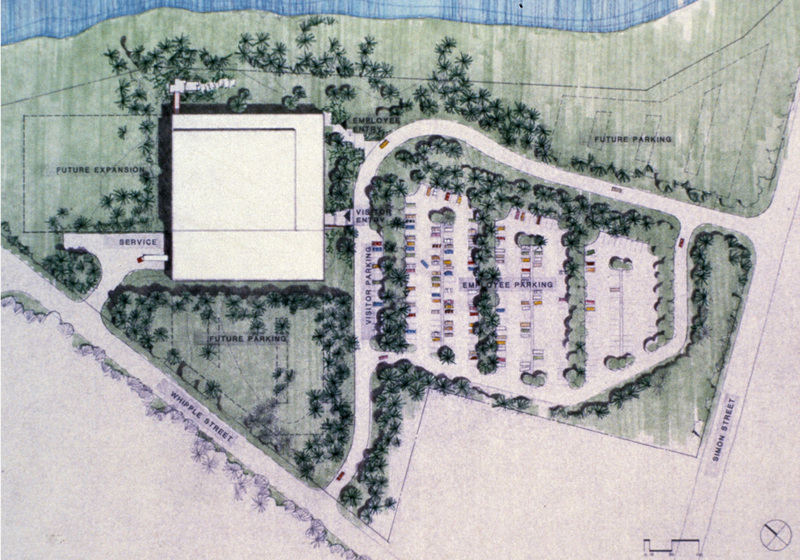 The site, in a new industrial park along the Nashua Canal and Mine Falls Park, had water views and a trail system along the canal that would provide recreational opportunities to the employees. 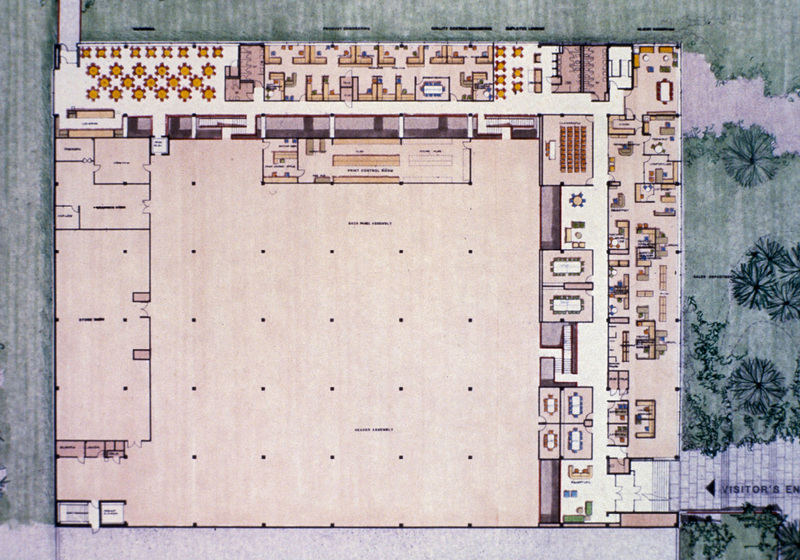 The final layout of the new building encourages interaction between company executives and production personnel. 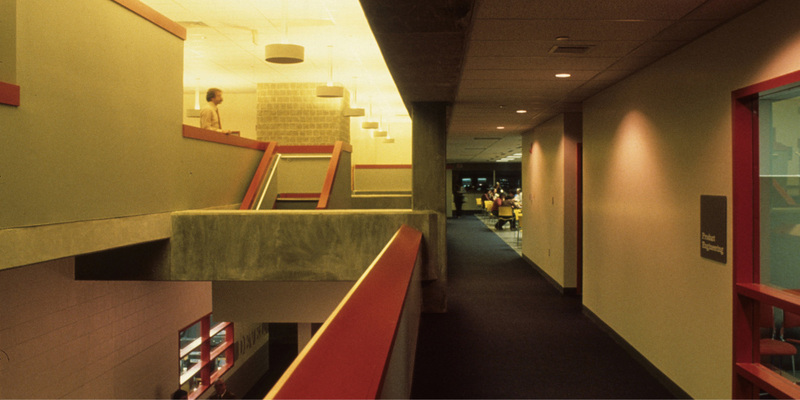 A two-story linear gallery with clerestory lighting and strategically located open stairways along an L-shaped corridor links four major areas: production, engineering, administration/marketing and the cafeteria. With this layout, factory workers share prime space and views to the Nashua Canal with company executives, allowing both groups to meet informally in the gallery heading to meetings, during breaks, and having lunch. One cannot help but always be aware of what others in the company are doing as everyone strives to create the best products. Two-story daylit linear gallery connecting the plant and offices. View looking towards the cafeteria. The exterior architectural expression and color of the low horizontal building was intended to contrast with the verticality and color of the tall spruce trees of the forest surrounding the building. The building emerges from the landscape with a rugged masonry base of light colored split face block. Above and suspended slightly in front of the masonry base is a crisp 4’ x 10’ red aluminum grid with insulated glass and solid cementitious panels arranged in a stepped pattern. This architectural “component system” was a metaphor for the company’s products: new technology built upon a solid base. It was not only about the design; the delivery of the building on time and on budget was an even larger challenge. Teradyne offered additional financial incentives to the design/build team to work harmoniously together and challenged the team to have the first 142,000 square foot phase of their campus operational within one year, while staying within an absolutely defined price. Together, we quickly determined that the structure had to be simple and started construction before the design was finalized. A cast-in-place concrete column and beam system on a 30′ x 30′ foot grid was agreed upon with pre-cast planks spanning beam to beam to create the floor. This is an example of component systems speeding up construction, similar to how the company’s component backboards sped up the assembly of computers. As construction proceeded, the design was finalized in an early application of “just in time” drawing delivery. The design/build team was able to successfully achieve the desired result and both Huygens and Tappé, as the architect, and Davison Construction Co., as the builder, realized additional financial incentives for our efforts. In 1981, the firm received the Grand Award in the Industrial Building Category of Builder’s Choice Design and Planning Award, which further demonstrated the success of the project. Teradyne Connection Systems was a growing business and two years after the completion of the first phase, the firm would add a planned 100,000 square foot expansion. TCS continued grow through the eighties, eventually recording profits as high as $132 million in 1993. By 2006 things had changed, manufacturing oversees proved more profitable and the parent company sold Teradyne Connection Systems to Amphenol. 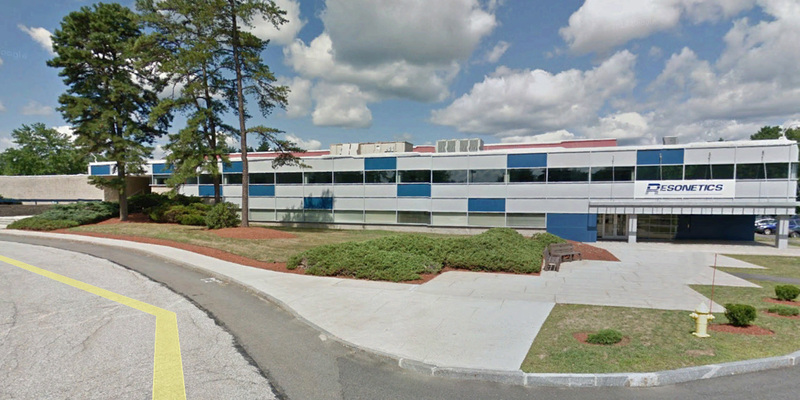 General Dynamics would occupy the building for a time and changed the colors to match their corporate blue and gray. An example of the “building as corporate billboard” rather than “building as a metaphor.” This approach demonstrates the importance of getting the colors right for the environment in which the building sits. Recently, Liberty Mutual bought the 250,000 square foot building and has been repositioning it into a multi-tenanted facility with multiple entrances to accommodate several high-tech companies such as Resonetics below.